It is a true privilege to have ClinCapture presented by Synergy Research Group in Moscow during the Clinical Trials Russia 2014 Conference. It is great to work with a partner that is working in an international space. 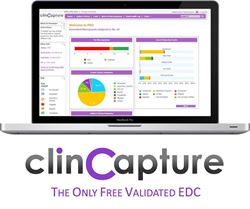 Clinovo’s Russian CRO Partner, Synergy Research Group will showcase ClinCapture, the only free validated EDC system at the Clinical Trials Russia 2014 Conference on November 19th-21st in Moscow, Russia.